Landowners participating in the program will be paid $150 per acre on top of CRP payments and revenue from timber harvests. The South Carolina Bobwhite Initiative is happy to announce that the USDA Farm Service recently released the availability for the long-awaited CRP Tree Thinning Incentive. The Conservation Reserve Program (CRP) is a wildly successful program that is administered by the USDA Farm Service Agency. It has been in existence since the 1985 Farm Bill. The original intent of CRP was to reduce soil erosion, enhance water supplies with groundwater recharge, improve water quality, increase wildlife habitat and reduce damages caused by floods and other natural disasters. Many of these practices were very beneficial to bobwhite quail, especially in the Midwestern states where CRP was widely implemented. In the Southeastern U.S., the results were not quite as positive for the bobwhites, whereas in the Midwest, CRP participants were planting native bunchgrasses and replanting grasslands. 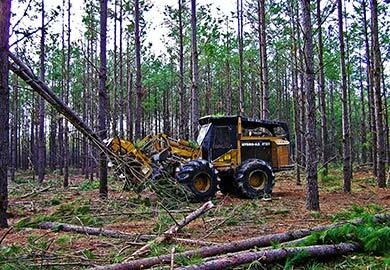 Most of the CRP acreage in the Southeast was put into loblolly pine stands. This benefitted quail and other wildlife for a while but, as the timber matured, the habitat became less suitable for wildlife. Wildlife biologists, foresters, and conservation biologists realized this rather quickly, but the corrective action came slowly. It wasn’t until the National Bobwhite Conservation Initiative answered the call and began pushing for assistance that change was brought about. Fortunately, the solution to the poor habitat quandary was an easy one- all it takes to improve the habitat in these monoculture loblolly stands is thinning to an appropriate basal area and adding a little bit of fire to the landscape. The NBCI went to bat for the Southeastern states and offered the solution of paying CRP participants for implementing mid-contract management on their properties. After several years and much to the joy of bobwhite enthusiasts across the Southeast, the 2014 Farm Bill authorized the use of these mid-contract management practices. And on Dec. 9, 2016, the USDA Farm Service Agency released the availability for the long-awaited CRP Tree Thinning Incentive. This tree thinning incentive comes in the form of additional money available to CRP participants who are willing to thin their pine stands to a wildlife-friendly basal area and utilize the use of fire or other approved management techniques to better their land for wildlife. Thinning and burning these monoculture pine stands will produce prime habitat for bobwhite quail, many species of song birds, southern fox squirrels, flatwoods salamanders, and even bees and butterflies. Not only will it create acres of pine savanna habitat that would otherwise not be available for these species, but it will also put extra money into the pockets of the landowners. The $150-per-acre incentive money available for completing these practices is in addition to the existing CRP contract payments and any financial benefit derived from harvesting timber. There are limited funds available and the first sign-up period is short, so those interested are encouraged to speak to their local FSA representative as soon as possible. A landowner who is interested in the incentive needs to be signed up by Jan. 6, 2017.